Life has gotten a little crazy, and for a while I'm going to have much less time to craft the original, well-thought-out content that you've all come to know and love (*cough*). Thankfully, the fantastic book bloggers I follow put up oodles of excellent posts every week. This feature will help keep my blog rolling and serve as inspiration to dive into my Feedly reader every now and then, no matter how nutty the unread count gets. Happy Friday, y'all! 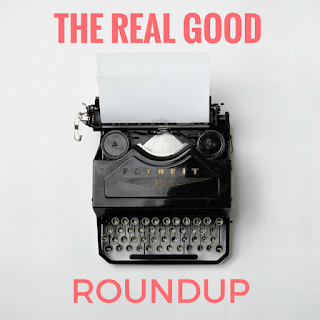 Welcome to the fourth edition of my Real Good Roundup. After a three-day streak of content last week, I've come up empty yet again, and even my blog visiting and commenting has hit an all-time low. The good news? I'm finally seeing light at the end of this tunnel! By this time next week, I'll be just hours away from taking my GRE and, with luck, knocking it out of my life for good. Just gotta keep this nose to the grindstone for seven more days. Andi of Estella's Revenge offered up some concise looks at three tough-to-review reads. All three are on my TBR pile, but I've had Between the World and Me since its July release date and, despite its teeny-tiny size, still haven't read it. Maybe Readathon will fix that! Did you guys hear about the Suffragette t-shirt promotion fiasco? Alice of Reading Rambo had a short, sweet and spot-on response. If you don't know already that Shannon of River City Reading is a book recommendation guru, have I got the post for you! She put together a "starter pack" of her most frequently-recommended books. I read two excellent posts about a More Diverse Universe (AKA Diversiverse): Trish of Love, Laughter, Insanity wrote about why she thinks the event is important and a pile of books to get you started, and Memory of In The Forest of Stories spotlighted (spotlit?) four Canadian authors of color, all of whom are women and new to me. Rachel of Dashing Good Books shared why she makes an effort to re-read books and got me thinking about re-reading a few myself, especially ones I read when I was younger and thinking about life in a different way. Ever struggled to write a book review? (If the answer is no, you either aren't a book blogger or I don't believe you.) Trish of Between My Lines shared some tips that help her get her thoughts on the page and put together a review organizer template. She's offering a PDF of the template free of charge to her readers—go get it!